Majestic Slots Casino South Africa has made sure that it is a user-friendly casino for the local market. Players can enjoy a quality gaming experience while playing from the comfort of their own homes in the ZAR (Rand). The online casino is operated by Midas Entertainment B.V. and is licensed and regulated in Curacao. Exclusive R100 Free No Deposit Bonus is available to all new players joining Majestic Slots via this website only. Simply Sign Up today and redeem coupon code : PC100 in the cashier section to recieve your R100 Free Bonus automatically. Take advantage of this spectacular welcome offer! 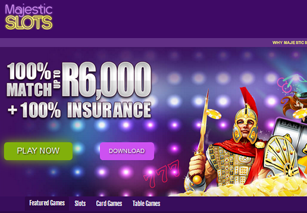 Sign up today and claim 100% match up to R6,000 + 100% Insurance if the odds are not in your favour, we will insure your first deposit by giving you back this amount so you can retry your luck in the casino. Those who wish to play in the mobile casino will receive an additional bonus. The R50 free bonus is given to players when they make their first deposit for use at the mobile version of the casino. The mobile casino bonus code is Mobile5. Majestic Slots Casino South Africa has a helpful and responsive Customer Support team that can be contacted by a local toll free number, by email, or by the Live Chat option found on the website. Customer Support is available 24 hours a day, 7 days a week, 365 days a year in order to respond to queries from both new and veteran players. Along with the EUR, USD, GBP and other currencies, the ZAR is also offered at Majestic Slots, and can be used by South African players. Being able to play in the local currency is definitely a bonus for the South African market where players wish to avoid steep exchange rates. Deposit and withdrawal options include Visa and Mastercard, Neteller, Ukash, Paysafecard, and Bank Transfers. Along with the excellent Welcome Package, the opportunity to play in Rands, and the top quality games that are offered from Realtime Gaming, players can feel safe and secure when playing at Majestic Slots. The online casino is dedicated to the safe and secure handling of player accounts, and uses an in-house security and finance department to ensure that players are given both quality service and privacy.